David McVicar's acclaimed Royal Opera production of Les Troyens is to be streamed and broadcast live to the UK and Europe on 5 July, starting at 5pm (GMT). The performance will be streamed online to UK viewers via The Space and broadcast via TV channel Mezzo to across mainland Europe, allowing audiences internationally the chance to see one of the most anticipated events of the London 2012 Festival. The performance will also be available around the world on demand on The Space from Monday 9 July until the end of October, and shown internationally on the big screen in November as part of the 2012/13 Cinema season. Hector Berlioz's opera is an adaptation of Virgil's Aeneid. It tells the story of the fall of Troy and the subsequent travels of Aeneas (Énée) to Carthage. The staging - transposed to the 1800s - matches the work's epic scope, with Es Devlin's designs featuring an impressive fire-breathing Trojan horse, fashioned from the machinery of war. Bryan Hymel and Eva-Maria Westbroek star. Les Troyens is sold out aside from returns, but for those who would like to feel for themselves the heat from the Trojan horse, 67 day tickets are available on the day of each performance. These can be bought from the Box Office from 10am. Your link for 'The Space' takes you to thespace.org.uk; I think you probably mean thespace.org? Many thanks Gareth, we have now amended. When you 'say' "streamed" do you mean I can watch this via my laptop? Or do you mean I have to go to The Space???? Sorry for my lack of knowledge! Glyndebourne's streaming is available worldwide, why do you have to restrict it? It doesn't affect me personally because I am in the UK and going to a live performance anyway, but I know at least one person across The Pond who is going to be *very* disappointed that it will not be available there. The streaming of Les Troyens is being organised with the Space - a venture that the BBC are running with Arts Council England. To my knowledge all (or most) of the performances streamed on the Space are UK-only and the reason for this is the complexity of arranging the rights with all of the performers involved. I can't comment on the arrangements that Glyndebourne have with the Guardian, but when we ran the Royal Ballet Live event with YouTube and the Guardian it was available internationally. 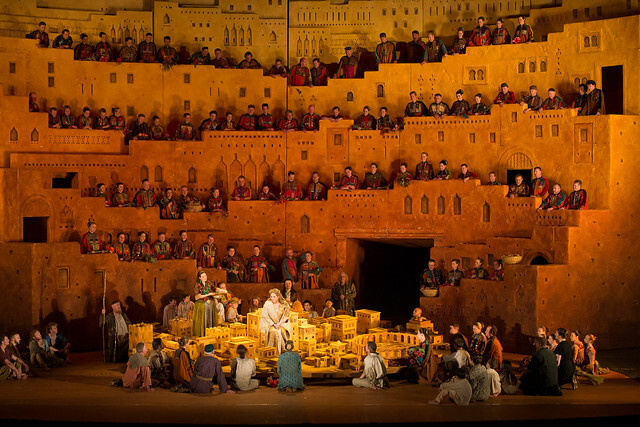 Les Troyens is one of the productions in our 2012/13 cinema season and will be available to watch in cinemas internationally. Hope I can watch it also in Poland! Mezzo - the company due to televise Les Troyens - is active in Poland, but you will need to check their website to find out how you can see it. Can you say why this production is not broadcast live on Freeview TV in the UK, or directly to UK cinemas but only to mainland Europe? I am not going to see much of the superb spectacle on a 15 inch screen and dodgy broadband connection. Why should people in the UK who pay for the ROH have to wait till November to see it as it should be seen? This is a question for the BBC, who make the decision about which productions appear on UK television. We hope that many people will enjoy Les Troyens when it is streamed live (supported by the BBC and Arts Council England) and the ability to catch up afterwards. As you say, the production will be on the big screen in November. Is this streaming going to be available in different sources for viewers outside Europe? We're afraid streaming is only possible in the UK with TV broadcast to mainland Europe (not UK). If you're outside Europe, we're afraid it's not possible to watch on 5 July, but Les Troyens will be screened internationally in November as part of the 2012/13 Cinema season. You advertise that Les Troyens will be shown on Space and Mezzo. But how do I find out how to access these channels either on my Sky TV or through streaming to my computer. There is no explanation how to find these channels that I can find. Tim, people in the UK are the only people to see it at the moment 'as it should be seen' - live on the Covent Garden stage! I live in Montreal, Canada and we do not have big screen opera season from Europe either. Whilst I don't wish to sound Cassandra-like,I wonder if all this videoing of opera performances affects production style at inception. What makes good film doesn't always make for good theatre,with too much finicky detail to absorb on stage. Occasionally in McVicar's "Trojans" I felt this. But it's a fine show nonetheless. Indeed, Jules... in fact, the whole "Troyens" team, root and (burning) branch, deserve top billing. Despite some lukewarm reviews (e.g. Sunday Times of 1st July), rarely have I seen such a uniformly well-executed performance from all concerned. A magnificent piece of theatre, from beginning to end. When are you going to announce the *exact* date for this to be shown in the cinema? People would like to put it in their diaries to keep the date free. You have announced the dates for nearly all the other 2012-13 cinema screenings apart from this. Thanks for your comment. With 700+ cinemas carrying our productions across both opera and ballet, it's quite an organisational task for our Cinema team. We will be announcing details soon though so keep an eye out. The Space website does not give any information about the time of the screening (I can work that out from the ROH site, but not everyone starts here) or how long it will be available (you say to end October: is this definite, or just a hope?). If you click through from the Space home page to Troyens, all you get is a black screen with no information. The screening will begin at 5pm GMT. As we say, it'll be available until the end of October. Hi - you say above that there might be a DVD of the 5 July performance. Please, please do one! It was wonderful and I would definitely buy it.